How to Choose a CSA - Get the Good Stuff! This is the time of year when CSAs fill their customer lists – so if you have been meaning to look into a CSA, it’s time to act now. You’ve heard of CSAs, right? CSA is short for Community Supported Agriculture, and it’s a great way to buy local seasonal food directly from a farmer or group of farmers. I am a member of the City Commons CSA, a cooperative of Detroit farms – yes, really, urban farms right in Detroit. CSA members purchase a subscription to the farm produce: we buy a seasonal share in the farm, which provides us with boxes of fresh produce (and sometimes flowers) every week during the growing season. Each CSA is unique; each has its own policies and standards, but the basics are the same: pay a fee, share the harvest, and share the risk: if rain or hail wipes out the crop, that’s your green beans gone; if there’s a fantastic month of rain and sun, that’s your bulging market basket. Why would you want to join a CSA? In my case, it has to do with freshness and sustainability: my CSA provides me with ultra-fresh locally grown food. The farm(s) use sustainable good-for-the-environment methods. I get to know my farmers, and they get to know me, which helps me feel connected to the land and the seasons. I pay for my share in the late winter or early spring, and that’s all I pay for a 20 week supply of produce boxes. And each week, it’s like opening a wonderful gift: what’s in the box this time? Some people might not like it, though. That weekly surprise that I love? Some people hate not knowing exactly how much of exactly what’s going to be in their share. The quantity of produce will naturally change during the growing season. You might not get enough of (whatever) or you might get MORE than you’re prepared for. Maybe you only like 3 or 4 specific veggies and aren’t open to trying anything new. Perhaps you don’t much like cooking, or think that starting with raw produce is just too much work. Let’s say, though, that you love the idea of getting ultra-fresh local veggies every week. How can you find a CSA, and what should you consider as you decide which one is the right one for you? Locate nearby CSAs. Your newspaper might have a list; there may be fliers at your local farmers’ market or food coop, or check online. There’s a CA directory with more than 2000 farm listings at www.localharvest.org. How much food do you need/want per week? Farm share sizes vary, and so do household sizes. Are you feeding yourself, or a large family? Does the farm you’re considering have options in share sizes, or allow every-other-week shares? Cost and payment options vary from CSA to CSA. Some expect members to lend a hand with farm work, others do not. 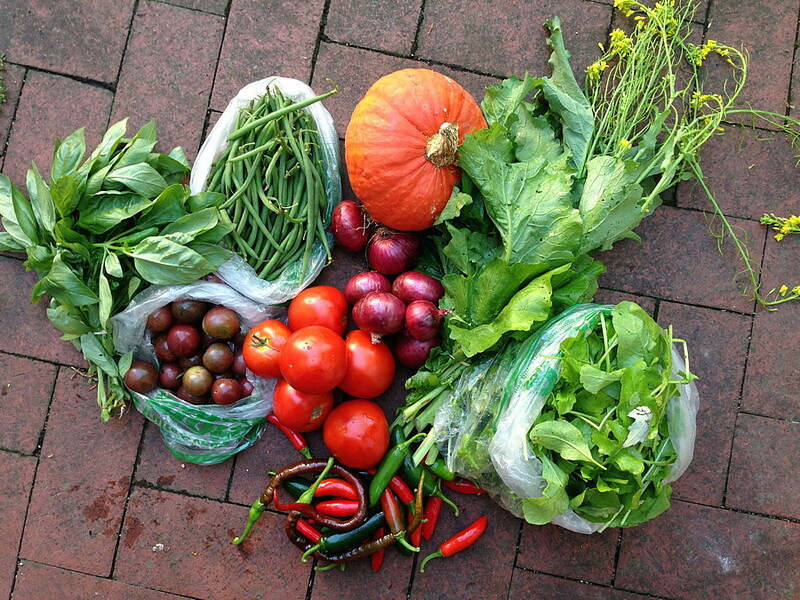 Some CSAs have payment plans, others require all funds at the beginning of the season. Produce choices are limited in some CSAs. Many will offer add-on options like flowers or eggs. Some offer extra ‘storage’ shares in the fall or ‘canning’ shares. Farm policies also vary. Be sure you understand what happens with your box if you forget to pick it up, or go on vacation. Are there opportunities to work or to bring your kids to the farm? Risk is inherent in joining a CSA. Nobody can be certain what the wind and weather will bring over the growing season. It’s a good idea to ask farmers for references from former CSA members, or read reviews on Local Harvest or other online sources, before you join. When I think about what changed for me once I joined and adjusted to my CSA, what stands out is that I needed to re-arrange how I thought about my family’s meals. I used to choose a weekly menu, then make a grocery list. Now, each week I unpack my box of fresh produce, and as I clean, trim, and package the veggies, I think of what I might make with what’s now on hand. Only then will I list a menu – and my goal each week is to use up every scrap of that box. It’s a very old-fashioned approach. For 20 glorious weeks of the year, my focus is on the best of local produce – and I’m eating better than ever because of it.